per DOUBLE ROLL INTERNATIONAL ORDERS: Contact us for a CUSTOM INTERNATIONAL SHIPPING RATE. DO NOT SELECT THE BORDER RATE. 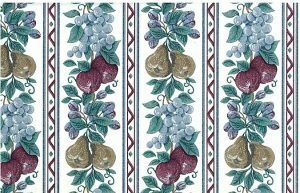 Fruit floral striped vintage Wallpaper Designer pattern featuring a fabulous combination of grapes, flowers & vines in Cranberry, Green, Cream & White. 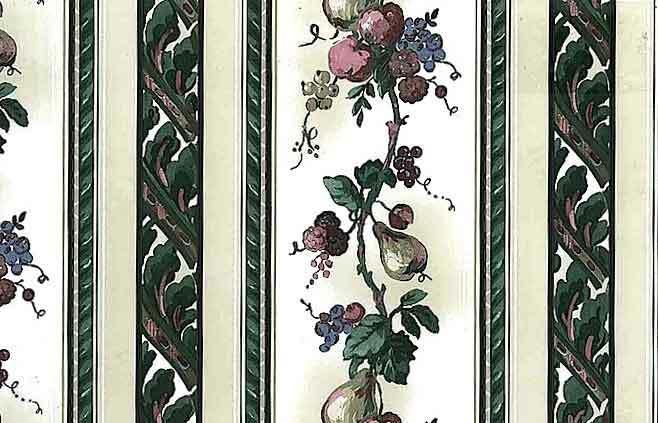 Broad bands of a vertical floral pattern on White alternate with a striped pattern including deep colors and Cream side bands. 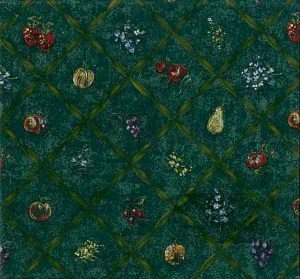 Great choice for a Kitchen or Breakfast Room.